Wagers placed at CanPlayCasino.com games may contribute at different levels towards the overall wagering requirement to clear a bonus. * All Casino Bonuses from promotional offers carry a 30X play through requirement unless otherwise noted. A player has a $100 Casino Bonus with a 10X play through wagering requirement. The Player wagers $1,000 on 100% slot machines. All $1,000 or (100%) of their slot machine game wagering contributes towards the wagering requirements to clear the casino bonus. The wager requirements would be satisfied in this example..
A player has a $100 Casino Bonus with a 10X play through requirement. The Player wagers $500 on 100% slot machines, $250 on European Roulette and $250 on Deuces Wild Video Poker. The $500 in slot machine game wagering contributes 100% towards the wagering requirements to clear the casino bonus. The $500 wagered on non-slot machine games ($250 on European Roulette and $250 on Deuces Wild Video Poker) will contribute 20% towards the wager requirements to clear the casino bonus. 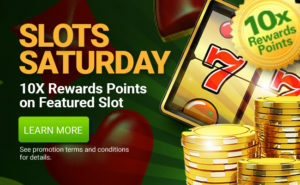 In this case, $100 of the $500 wagered on these non-slot games would count toward clearing the casino bonus. In total the player in this example would have cleared $600 of the 10X wagering requirement ($500 from the slot machine game play and $100 from the European Roulette and Deuces Wild Video Poker play). CanPlayCasino.com reserves the right to change or cancel any casino bonus in its entirety at any time. CanPlayCasino.com also withholds the right, at its discretion, to exclude any individual or individuals from participation. 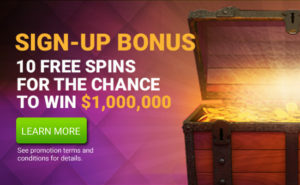 All Free Spins awarded on the CanPlayCasino.com Million Dollar Slot Machine through any promotion expire 15 days after issuance. 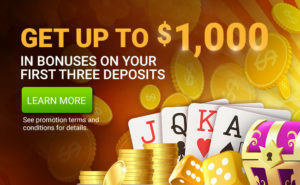 For full terms and conditions of the CanPlayCasino.com Million Dollar slot click here.